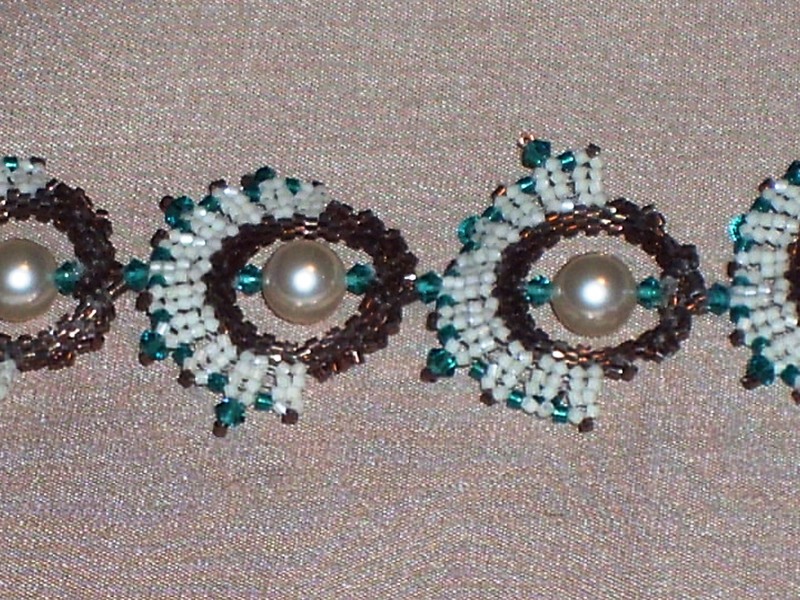 I have finally finished up the Ruffled Chain bracelet from Beadwork’s February/ March 2011 issue. This bracelet shouldn’t have taken as long as it did. Remember I posted the earrings I made from the pattern back in June 25, 2014. I did start this when I got the supplies in July 2014. 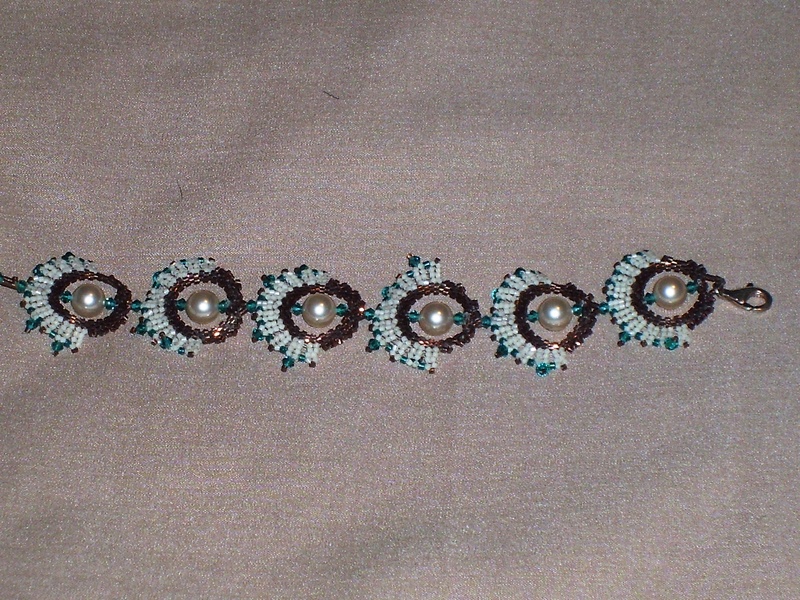 But I ended up having to redo the complete bracelet twice! The bracelet got put on hold for quite a while. I absolutely can’t stand the clasp that was written into the pattern instructions. It was the reason I had to redo the bracelet twice. I started with the button and odd-count circular peyote stitch loop. My first button was a crystal rivoli button (which probably wasn’t the best choice). The thickness of the crystal rivoli button hampered the clasp. I just did it to make it around the circle but when I was finished the odd count loop was just too tight to make it around the rivoli because of the thickness. I had beads in the loop break and the clasp wasn’t very secure. Second try didn’t seem to fair much better than the first. This time I tried a crystal 4 hole button (so it was flatter). I really didn’t want to hassle with trying to make another odd count circular peyote stitched loop, so I used a simple beaded loop (I probably went through the beads at least three times). That loop didn’t last long either, as I am putting the button through more beads crack and break. So the project stayed shoved in a Clinique bag for at least a year, year and a half before I decided to redo it again. I think the real push was the teal t-shirts that I recently made. But this was going to be the last time I ever make this exact bracelet again. That means that the clasp had to be changed. In my beading stash, there was a large silver lobster claw clasp, so that was what I used. The other end is a simple loop for the lobster claw clasp to hook on. If I had put more thought into the clasp change, a beaded toggle clasp would have really worked well here. 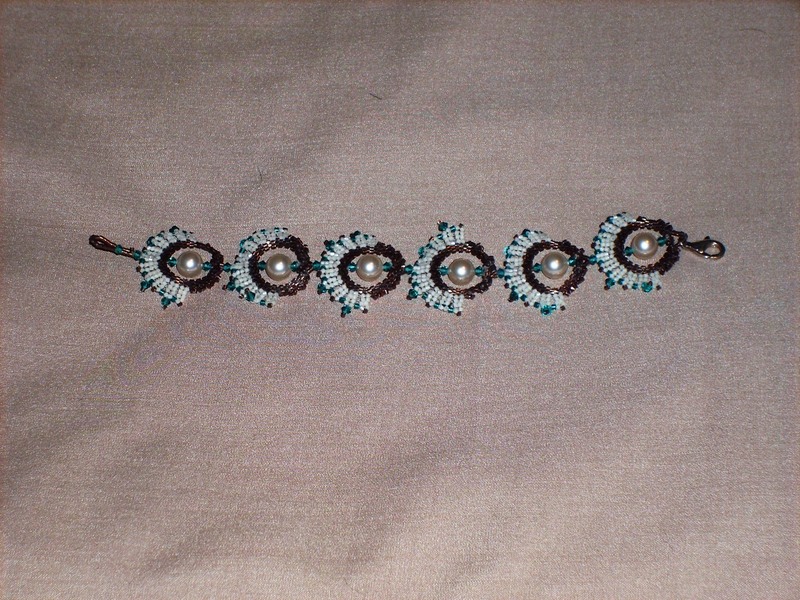 As for the Beadwork stats, they rated the project 2 beads (advance beginner/ intermediate) and uses circular peyote stitch, herringbone stitch, and picots. I think the rating is a little high; really the tricky part is getting a good tension on the circular peyote stitched circle for the ruffled links (I am not even considering the clasp in the review of difficulty). 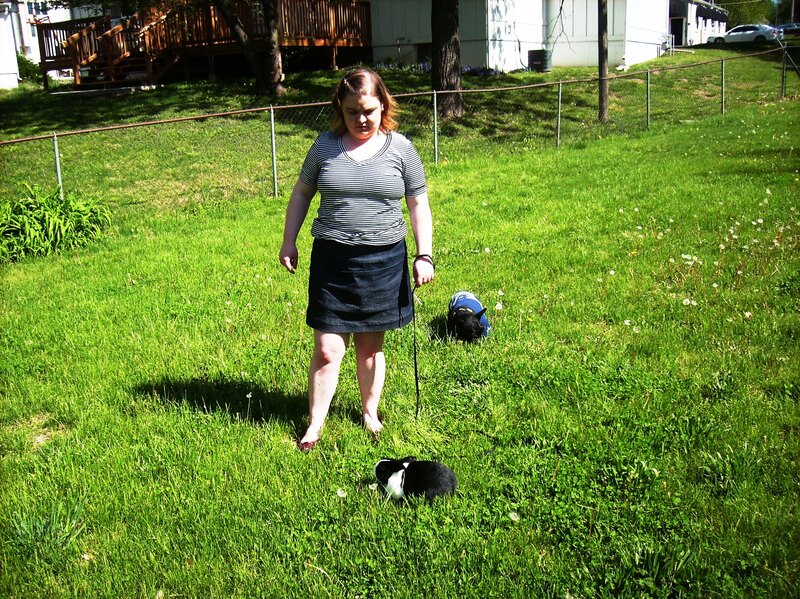 Looking at great everyday clothing, I realized I am lacking a denim blue jean skirt. Thanks to my mom I got two yards of denim (or as she told the lady cutting 2 pounds of denim). I choose to use the skirt Vogue 1247 (Rachel Comey) again. I love my tan denim version; however, it is a little short to wear to work without leggings on under. It is hard to believe that this pattern is out of print now especially when you look and see 120 reviews for it on Pattern Review. Like before I used the size 18. But this time I took the bottom skirt front and bottom skirt back and added 2 inches in length (most of this ended up being use in the hem of this skirt). For a faster sew, I didn’t use the bias binding on the seams. I went ahead and used my serger instead. 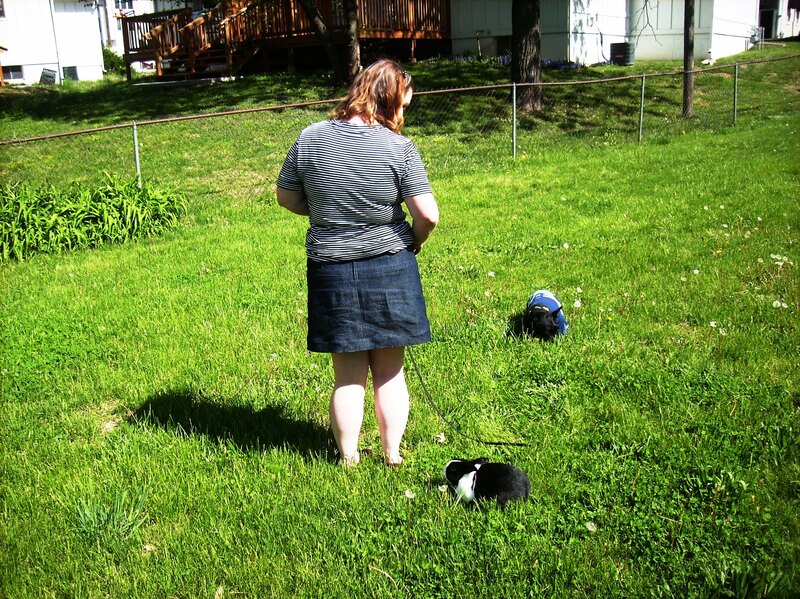 Because of the stretch of the denim, I pulled in my side seams an extra quarter-inch on each side. The pockets use a little of the quilting cotton I picked up to make my Samantha doll a new dress (not even started her dress yet but do have the pattern cut).